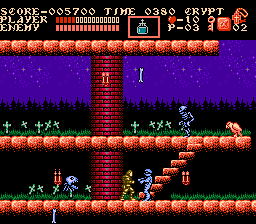 An all new Castlevania adventure is here on the NES! New stages, graphics, items, enemies, music and gameplay for Castlevania fans to enjoy. Select from 5 exciting stages before reaching the final showdown with Lord Ghulash, an evil necromancer terrorizing Transylvania in the wake of Dracula’s defeat. It is up to Simon Belmont to rescue his homeland once again, this time from the perversion of the 7 Holy Relics. Collect all the relics to lift the curse, and use them to your advantage along the way. For further details, (Story, Gameplay, etc) please consult the read me file. Optomon Hacking Programming, music, some graphics. Though I’ve never played Vampire Killer, I understand that this is what it is like. Instead of just making your way from door to door, you have to smack candles until you find the key that will open said door. 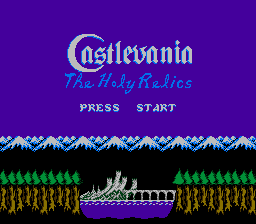 This works surprisingly well with Castlevania’s mechanics, and makes levels engaging in a different way from the original. Instead of just brutalizing you, the game makes you manage exploration with staying alive. Additionally, you have the relics, which you can acquire in any order, though their usefulness varies a great deal. 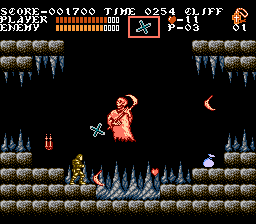 You start out with the cross, which kills everything on the screen, and once you get the crown, there’s little reason to use anything else, since it allows you to kill most bosses in 3 hits, and lasts long enough that you’ll probably only have to use it once; grab yourself a throwing axe, get the triple multiplier, and BAM! Victory. On the other side of the coin, there’s an item that just increases the amount of points that you score. Either way, it’s exciting to tackle new stages and find out what your new prize can do! 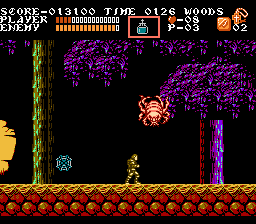 The graphics are very good; much of the graphical overhaul is lifted from other Castlevania games, but you’ll find a decent amount of original artwork, as well. Despite this mix, the visuals are a surprisingly cohesive package. Palettes are simultaneously dark and colorful, creating a lovely, bold aesthetic. The actual stages’ identities are various, but fit within the Castlevania universe, and show a deep love for the series; it fleshes out the world in a way that most canonical games in the series do not. 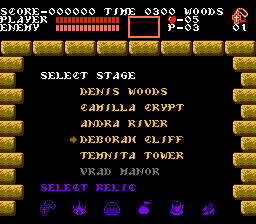 The music is not all new to the series, but all of it is new to the original Castlevania.